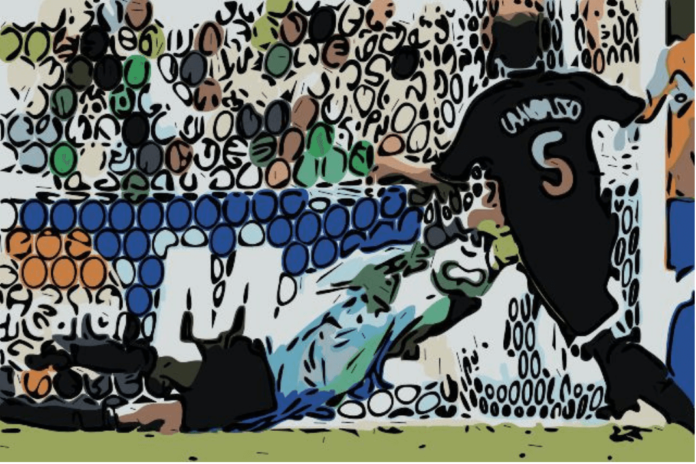 Jens Lehmann dived to his left, beating down Esteban Cambiasso’s penalty and in doing so progressing Germany into a World Cup semi final. This save was the spark which ignited a mass brawl on the field. Several punches were thrown, as well as a vicious kick by Roma defender Leandro Cufré. Argentine manager José Pékerman resigned from his post following his team’s exit and the nation was distraught at this embarrassing end to their tournament. Why was there such outcry at this defeat? Big teams crash out of the World Cup every four years and to lose on penalties to the hosts was hardly the most embarrassing of exits. It wasn’t the manner that Argentina had lost that got to the fans, it was the fact that they had lost at all. The Argentines almost always go into a World Cup as a favourite, but this year felt different. This was the first post-Maradona year that there was more than just expectation – there was a genuine reason behind the hope. They had a wonderfully blended squad full of experienced heads and hot prospects. Veterans like Hernan Crespo, Roberto Ayala and Juan Román Riquelme were entwined with the up and coming Carlos Tevez and a certain prospect by the name of Lionel Messi. The Argentines had won the Gold Medal at the 2004 Olympics and the squad appeared to be in the ascendency after Jose Pékerman took over the team midway through qualification. It may seem unusual to claim that a team had real aspirations of winning the World Cup when they failed to even win their continental qualifying campaign – they finished second behind Brazil, although they did amass more wins than their rivals. Their World Cup qualification kicked off in September 2003 and got off to a disappointing start: a 2-2 draw against Chile. Normality restored with routine beatings of Venezuela and Bolivia, before another draw, this time against Colombia, stunted their momentum. The squad was in transition with the young players still adapting to the intense pressures of the Argentinian fans. The experienced members of the squad couldn’t carry everyone, a low light coming in an away match to Brazil. A trio of Ronaldo penalties sunk the Argentines that day and resigned the visitors to just two wins from five matches. The nation was in dire need of a spark, and that spark was ignited in the 2004 summer Olympics just a month later. Marcelo Bielsa’s squad took Athens by storm, winning every single match, scoring 17 goals and keeping a clean sheet in every single game of their Gold Medal campaign – a young Carlos Tevez dragging his nation to glory. This was historic as it was the first time that a South American team had won the Gold in Olympic Football since 1928. Argentina came back from the Olympics with their spirits high and earned a professional win over Peru. Despite a comfortable win away from home, Marcelo Bielsa walked away from his post. He had them 2nd in qualifying after eight games, being replaced by Jose Pékerman. Pékerman continued where Bielsa left off and guided the Argentines to a 2nd place finish. It was a frustrating campaign for them: they managed big wins over Brazil and Uruguay yet managed to squander points to Paraguay, Ecuador and a damning final day defeat to Uruguay in Montevideo. A point on the final day would have been enough to take top spot, yet they simply couldn’t get the job done when it mattered. Despite this final day frustration, the campaign was still encouraging. This was a squad with a number of young and inexperienced players who were beginning to gel. The campaign saw Argentina finish runners up in the Copa America and champions of the Olympics alongside qualifying, while José Pékerman took over from the departed Marcelo Bielsa and continued to push the team on to Germany. Spirits were high overall in Argentina in the lead up to the World Cup. They were given a tough draw, pitted in Group C against former final foes, the Netherlands, European qualifying superstars Serbia & Montenegro, and the exciting unknowns, Ivory Coast. This was the Group of Death. The Ivory Coast were the first up to face Argentina. Despite the talk of the new faces lighting it up for Argentina, it was an old face that kicked off their tournament. Hernan Crespo reacted to a loose ball in the box to stab home the opener. The camera panned the crowd amid the celebrations to see a certain Mr Diego Maradona in jubilant cheer. Young learned from the old as Javier Saviola latched on to a perfectly timed through ball from Juan Román Riquelme to put them two up before the break. A young Didier Drogba did well to evade the Argentine defence to fire the Ivory Coast back in with a shout with ten minutes to go, but the West African outfit could not convert their chances into an equalising goal. The more critical Argentine fan may have hoped for a higher score but the win was coupled with a pleasing performance. What’s more, the Ivory Coast, despite being World Cup debutants, were a much more resolute side than the likes of Angola and Togo, two fellow African first-timers who were not fit for purpose in this tournament. The Group of Death is traditionally a tough match up of hard to beat teams. Serbia & Montenegro were a resilient and exciting team in qualification, yet when they met up in Schalke’s magnificent stadium in Gelsenkirchen in front of 52000 fans it was boys against men. The Balkan nation had narrowly lost their opening match against the Netherlands yet must have felt quietly confident going up against the Argentines. Argentina were good, but they weren’t unbeatable. The next 90 minutes were a disasterclass by Serbia & Montenegro as they were massacred 6-0. Argentina put together some magnificent passing play to split open the defence with Maxi Rodríguez opening the score after only six minutes. An injury to Lucho González after just 17 minutes put a dampener on the mood, though this was soon forgotten. His replacement was Inter Milan midfielder Esteban Cambiasso; a more defensive minded player who ended up scoring one of the most iconic goals in World Cup history. Cambiasso played a ball into Hernan Crespo in the box. Crespo performed a mouth-watering backheel to return the ball to Cambiasso who struck the ball into the back of the net from 12 yards, falling to the ground as he struck the ball. He picked himself up and ran to the corner flag, hiding his face in his shirt, pumping his fists and falling to his knees, overwhelmed with joy. The finish may not have been spectacular, but the reason for the defensive midfielder’s exuberant celebration was that it finished off a 24 pass move. 24 passes uninterrupted. This was no goal; this was a work of art. Hernan Crespo raced beyond the Serb defence to chip the ball over the keeper, only to have the linesman wrongly flag him offside. In a tight game this miscall may have infuriated the Argentines, yet Crespo, while irritated, seemed pretty content to watch minutes later as Maxi Rodríguez smashed the third goal of the game in off the post. Three up at the break, Péckerman had evidently told his side to ease up in the second half, and they held true to this plan for a while. That was until Mateja Kežman assaulted Javier Mascherano with a brutal two-footed lunge in the middle of the field. This tackle resulted in a red card. This red card saw not only the end to Kežman’s game but also his international career, the former Chelsea forward never receiving another call up for his national team again. The final fifteen minutes were punishing from Argentina. A young Lionel Messi was brought on for Maxi Rodríguez and made an instant impact. He received the ball into feet from a free kick, outpaced his marker and crossed the ball in for Crespo to get goal number four. Carlos Tevez scored goal number five, a goal that was typical of Tevez. It was bullishness and finesse all rolled into one. Lionel Messi finished off a fine passing move by scoring the 6th with two minutes to go. This was another goal of sumptuous passing culminating in a sweetly struck shot giving poor Dragoslav Jevrić no chance. A much-rotated Argentinian side secured a point against the Netherlands to win the South Americans the group. Had this been played in matchday one or two then both sides would surely have gone hell for leather in a heavyweight encounter, a match up harking back to the 1970s. Both sides were already secured a knockout game in the World Cup and with their opponents set to be Portugal or Mexico, both sides seemed happy to play out a tactical draw and take their chances. In Group D Mexico laboured to second place, earning their progress in the knockouts due to the inadequacy of Iran and Angola. They raised their game massively for the round of 16 tie against Argentina and even took the lead six minutes in. Rafael Marquez reacted first to a flicked on free kick to stab the ball beyond Roberto Abbondanzieri. It would have been easy for the Argentinians heads to drop after this disappointing start, yet they rallied well and scored an equaliser through their talismanic striker Hernan Crespo. Riquelme delivered in an inch-perfect corner kick which Crespo met on the volley from a couple of yards out. The following 80 minutes remained goalless and the 2006 World Cup was presented with its first extra time match. Players tired, the passes became longer and the shots more desperate. 29 and a half of those 30 minutes were decidedly ordinary, broken up by one moment of sheer majesty! Juan Pablo Sorín, Argentina’s left back and captain, received the ball halfway between the opposition box and the halfway line. He lobbed the ball across field to the right side of the 18-yard box. The ball was collected on the chest of Maxi Rodríguez who, in chesting this ball moved it back to around 20 yards from goal. He swivelled his hips to turn and leather the ball towards goal, and leather it he did. The ball swerved and dipped at such a pace that it evaded the helpless goalkeeper and nestled into the top side of the net before dropping to the ground – the first time that it had touched the ground since it left the foot of Sorín. The teams walked out to that oh so iconic World Cup orchestral music. The national anthems blared out and the excitement in the stadium was palpable. The noise was deafening as the 72000 fans in the Olympiastadion cheered on their teams, the majority of which were cheering for the hosts. If Argentina were going to win, they were going to have to silence that home support, and they did just that after ten minutes. A Juan Román Riquelme corner was crucial once again for the South Americans. The ball was met by their Mr Dependable, centre back Roberto Ayala. Ayala outjumped his marker, Miroslav Klose, to power his header past Jens Lehmann. The keeper seemed unsure of whether to collect the ball or stay on his line, ultimately getting caught in no-mans-land. Miroslav Klose may have been culpable for letting Ayala outmuscle him to score the opener, but he was certainly no lightweight. He clashed with Roberto Abbondanzieri late in the second half competing for a cross, forcing the goalkeeper to be subbed off. The clash was accidental, though that did not make the impact of it any less crucial. The Argentines were incensed at their goalkeeper having to leave the field injured while Klose wasn’t even cautioned for his challenge. Abbondanzieri was replaced by young Leo Franco, with the Argentine having to pick the ball out of his own net ten minutes after coming on. A Michael Ballack cross was flicked on by Tim Borowski into the path of Miroslav Klose – the Polish-born German stooping low to bullet his header past Franco. Extra time went by in the blink of an eye, both teams seemingly exhausted after a punishing game, particularly the Argentines who were playing their second extra time game in a week. There was a moment of controversy as Maxi Rodríguez tumbled in the penalty area with the referee brandishing a yellow card for diving. Replays show that there was a claim for a penalty, though the call was tight. Slovakian referee Ľuboš Micheľ blew for an end to play and a penalty shootout was needed to decide the game. Substitutes Oliver Neuville and Julio Cruz both scored their country’s first penalty, with Michael Ballack making it 2-1. Up stepped Roberto Ayala, the scorer of the opening goal. He hit his penalty low to his right and watched in horror as Jens Lehmann dived on top of the ball. Lukas Podolski and Maxi Rodríguez each scored the third penalty a piece with Tim Borowski making it four from four for the Germans. Up stepped Esteban Cambiasso who, despite taking a long run up, put too little power on his shot. This was pushed away by Jens Lehmann who had more than made up for his error for the opening goal. The game was over – the drama was not. Cambiasso walked away in tears. Rodríguez just sat on the ground, seemingly in disbelief. Lehmann walked away coolly, fist pumping and finger wagging. Torsten Frings, perhaps less coolly, threw an imaginary bowling ball, knocking down his pins – his national teammates. Frings not only threw an imaginary bowling ball, but he also threw a punch. According to Michael Ballack, each German penalty taker was subjected to horrific verbal abuse by the Argentines as they walked to the spot to hit their penalties. Tim Borowski put his finger to his lips to “shush” the Argentines as his penalty put them in a position to win. Details of the fight are hard to come by, there are few highlights that show anything substantial, while the players seemed content to leave the ugly scenes on the pitch. Frings was reported by several for squaring up to Fabricio Coloccini and Juan Pablo Sorín, Maxi Rodríguez punched Bastian Schweinsteiger and worst of all, Per Mertesacker was brought down by a kick from Leandro Cufré. Once the drama of the fight subsided, attention was focused back to the game, and in particular, Jens Lehmann. The German saved two out of four penalties, guessing the correct way on all four occasions. Was this luck? Was this quick time reaction? Partially, yes. But there is more to it than that. How did the Arsenal goalkeeper prematurely end the Argentinean golden generation? Simple. He did his homework. He studied the penalty habits of the usual La Albiceleste penalty takers and had that scrap of paper, anointed by the media as “Lehmann’s List”, close to him during the shootout. Many people, including Argentina’s Juan Román Riquelme, believed this to be nonsense, insisting that this was nothing more than a simple delay tactic, though the big German keeper assured fans that this was legitimate. It was a crushing way for Argentina to depart the tournament that they had such high hopes of succeeding in. The “Golden Generation” of Argentina had played such scintillating football in Germany, they scored two goals that deserve to be in every World Cup compilation made from now until the end of time. Jose Péckerman and his team, particularly Hernan Crespo, Juan Román Riquelme and Maxi Rodríguez, played brilliantly at times and created an abundance of highlights, yet the Quarter Finals is where they fell. Highlights are great for the neutral, but for the proud Argentinian fans this tournament was an opportunity missed – the search for their third World Cup had officially hit a 30 year wait. The shine of their golden generation had darkened. Creative director for Tale of Two Halves. Proud member of the Ronnie Dog Media team. Dundee United fan and a World Cup fanatic! Follow me on Twitter.